Blackpool libraries have supported me from the off and I appreciate everything they have done. I was thrilled to bits when they offered to host a ‘launch tour’ for the new Eric Appleby book over the summer holidays. I visited four libraries over two weeks: Boundary Library, Moor Park Library, Palatine Library and Layton Library. 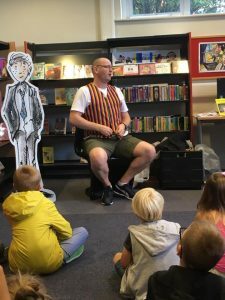 In each library, I shared the new book as well as putting on the storytelling waistcoat to share some of the Impossible Tales. 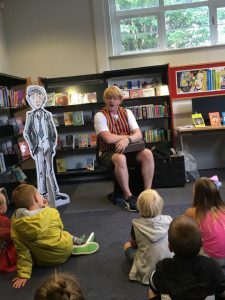 Two of the Tales proved very popular and it was great to tell the children about a crime-fighting wig and a mysterious ring that used to belong to my grandma. Some of the children even had a go at drawing Eric using Martin’s sketches as a guide. They did a great job and I think I may have met some of the illustrators of the future! 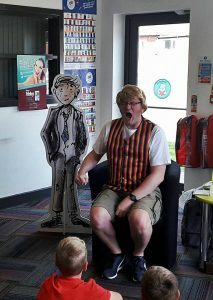 I loved my time in the four libraries and would like to thank all of the adults and children who attended the sessions. A big thanks must also go to Jane Berry at Blackpool Library Service, who coordinated the visits. Hopefully I’ll get to visit again soon to share more stories.